This saying said something to me straight away. I fill my journal with the “breathings of my heart” especially when dealing with a difficult time in my life. My book, Allergic to Life: My Battle for Survival, Courage, and Hope, is filled with the “breathings of my heart”. 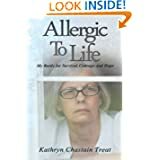 I included many excerpts from my journal written during the most difficult times of my journey through mold induced illness and chemical sensitivity. I found myself crying the other night. I was having an emotional meltdown at the passing of my father and could not sleep. My journal was once again there to comfort me. It allowed me to say all the things I could not say out loud. It allowed me to talk to my father and to write a poem about one of his favorite belongings, his lucky horseshoe (I am not yet emotionally ready to share the poem). I am still finding it difficult to resume my writing on my blogs or other projects that I am in the process of starting. Until I can write, I have my journal. Which quote resonates the most with you and why? Nothing says spring like a trip to Daffodil Days. My sister and I made our yearly trek to a winery a little over an hour from home. Daffodil Days officially starts tomorrow. We always go the day before when there are fewer people around and less exposure to chemicals and fragrances from all those people who bathe themselves in chemicals. Last year I posted pictures in my post entitled How I spent my “Be Kind to Yourself” Day. It was during this trip and photos we took that I found the photo for the back cover of Allergic to Life. We had thought about making the drive further to Daffodil Hill like last year. The wild daffodils on the hills near the winery were scarce and spent. We made the wise decision of foregoing the drive there this year. There is nothing more uplifting and soothing than beautiful flowers and a long overdue day out with my sister. I hope you enjoy these beautiful flowers as much as we did. For those suffering from chronic illness whether it be environmental illness (like mine), dealing with POTS, endometriosis, Marfan’s Syndrome, or Cancer, we rely heavily on our caregivers. If we are fortunate, our caregivers are kind, caring, supporting, and will go to any extreme to help us battle through. For me my biggest and most supportive caregiver has been my husband. He built me a safe house, worked hard and sacrificed to allow me to go out-of-state for medical care, and shopped for me. My dear blogger friend Karen Ingalls knows all to well what it is like to need a caregiver. Karen battled Ovarian Cancer and her husband was beside her all the way. Karen wrote a wonderful book entitled Outshine: An Ovarian Cancer Memoir. Karen’s story moved me; the courage and inspiration she shares in her book is something that can benefit anyone no matter their chronic illness. Karen recently discovered that her cancer has returned and will soon be fighting another battle. She recently wrote a post entitled Praise and Gratitude to Caregivers. In this post she shared a beautiful poem entitled Heart of a Caregiver. Please take a moment to hop on over to Karen’s blog and read this lovely poem and learn about the wonderful and inspiring Karen Ingalls. This post was originally shared on January 22, 2013. As I have read it again, it reminds me that everything happens when it is supposed to happen and at a time it is supposed to happen. It does me no good to dig in my heals and fight the direction I am going in. For I am doing what I am destined to be doing. This past year I have reconnected with many friends from high school. A reunion page was developed on Facebook and so many of us have found each other after years. My illness and sensitivities has made it even more difficult to even run into anyone who may still be living in town much less attend our class reunion that was held this past October. Since our timetable most often does not correspond with universal timetable, it’s common for people to feel that life is moving too slowly or too quickly. We find that our plans may fall into place when we least expect. Or, we are placed into roles we believe we are not prepared for and wonder how we will survive the demands imposed upon us by unfamiliar circumstances. When delays in our progress bring about pains of disappointment within us or the pace of life seems overwhelming, peace can be found in the simple fact that we are exactly where we need to be at this moment. Every person fulfills their purpose when the time is right. If you have fast-tracked to success, you may become deeply frustrated if you discover you can no longer satisfy your desires as quickly as you might like. Yet the delays that disappoint you may be laying the foundation for future accomplishments that you have not yet conceived. Or the universe may have plans for you that differ from the worldly aspirations you have pursued up until this point. What you deem a postponement of progress may actually represent an opportunity to prepare for what is yet to come. If you feel as though the universe is pushing you forward at too fast a rate, you may be resisting your destiny. Your unease regarding the speed of your progress could be a sign that you need to plant a seed of awareness within yourself and learn to move with the flow of fate rather than against it. The universe puts nothing in your path that you are incapable of handling, so you can rest assured that you are ready to grow into your new situation. You may feel compelled to judge your personal success using your age, your professional position, your level of education, or the accomplishments of your peers as a yardstick. Yet we all enjoy the major milestones in our lives at the appropriate time-some realize their dreams as youngsters while others flourish only in old age. If you take pride in your many accomplishments and make the most of every circumstance in which you find yourself, your time will come.